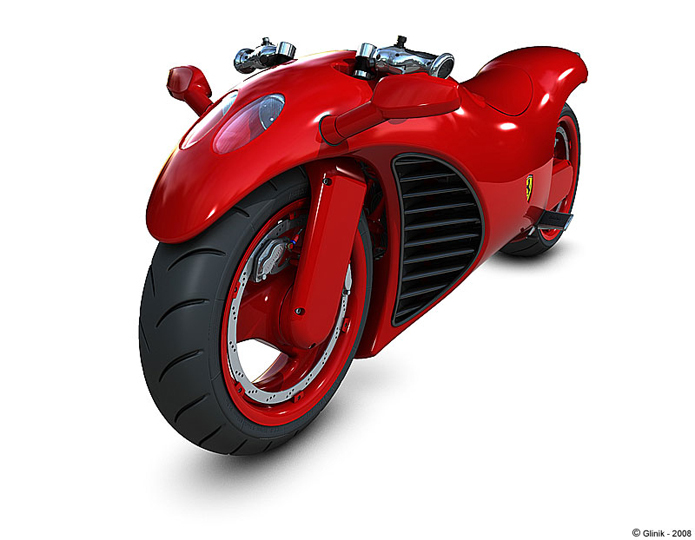 Have you ever asked the question “why is there no Ferrari motorbike?” well one designer certainly has. 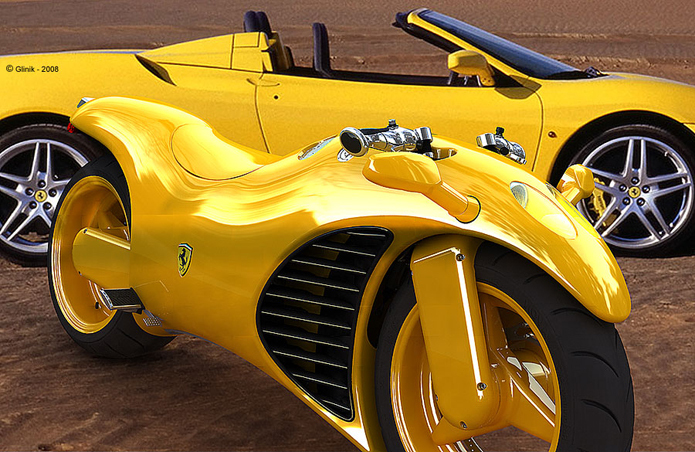 Israeli industrial designer Amir Glinik has come up and conceptualised an incredible Ferrari superbike using a modified engine from the Ferrari Enzo supercar. 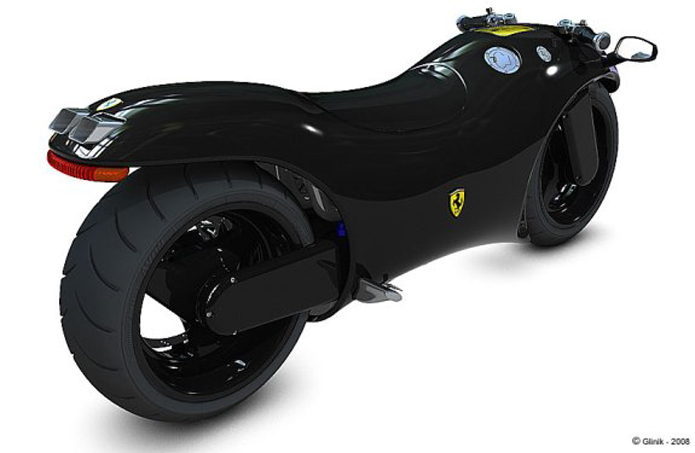 Amir’s design is influenced by the vintage and modern Ferrari projects and his idea is to produce a practical machine – not in any way a “sci-fi” future ride. 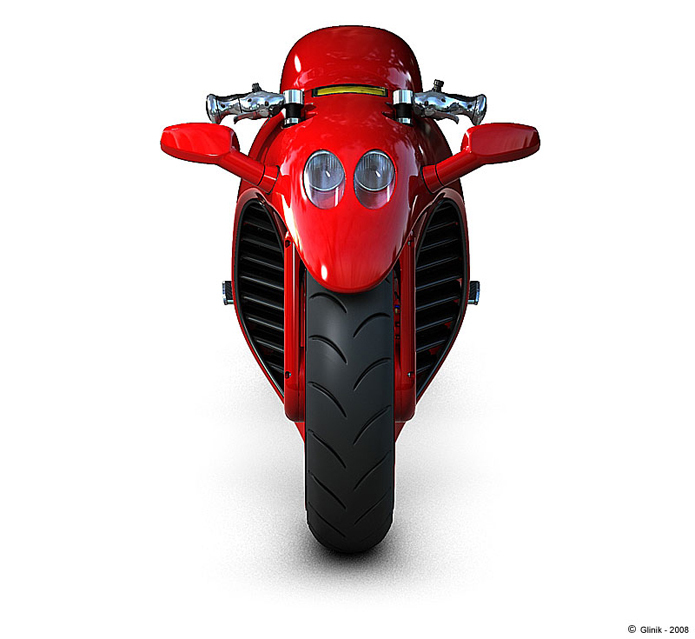 Using drive-by-wire technology, the V4 superbike features hand controls adapted from an F-16 fighter jet and buttons based on those found on the steering wheel of Ferrari’s Formula 1 race cars. Other controls for the sound system and trip computer are located on an all weather touchscreen with Glinik’s design also incorporating several high-tech gadget attachments, certainly reminiscent of Ferrari cars. Glinik started the project way back in 2005, and finally got around to outlining the key points of the project in 2008 and as it turns out, the concept goes way beyond a simple styling exercise. “Vintage and modern Ferrari projects influence my design,” Glinik notes. “It’s a mix of what I find to be the best Ferrari lines with the latest technology I could think of in terms of engine, gear and driving management.” Apart from the traditional Ferrari Red, Glinik also gives possibilities of a version in bright yellow and black! I hear you asking the usual questions “how fast does it go?” and “how much would a superbike like this cost?” Well I’ve done a fair bit of research into this and the only information or comment I have managed to get my hands on states “we can only speculate about very big numbers in both cases”. If you’d like to talk to us about how we can add greater impact to your brand why not give us a call. Beautiful example of a lover of a brand being able to ‘articulate’ its extension – if you want to know how far you can push your brand ask your advocates for advice. You’d certainly feel the wind in your hair with no screen on the bike – but what the heck this is about crawling ( or growling) down Rodeo Drive turning heads not touring! Samsung may well be Samsunk!